Having the Word as the steersman of the ship of his soul. 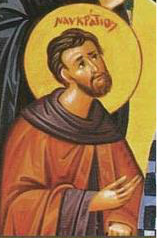 Saint Naukratios was born in 332 and was the son of Basil the Elder and Emmelia of Caesarea. He had distinguished himself both in scholarship and Christian devotion, as an active hermit, and a living example for his famous brothers, Basil of Caesarea and Gregory of Nyssa. He was the second of four brothers and died young in a tragic fishing accident in 358. "The second of the four brothers, Naukratios by name, who came next after the great Basil, excelled the rest in natural endowments and physical beauty, in strength, speed and ability to turn his hand to anything. When he had reached his twenty-first year, and had given such demonstration of his studies by speaking in public, that the whole audience in the theatre was thrilled, he was led by a divine providence to despise all that was already in his grasp, and drawn by an irresistible impulse went off to a life of solitude and poverty. He took nothing with him but himself, save that one of the servants named Chrysapius followed him, because of the affection he had towards his master and the intention he had formed to lead the same life. So he lived by himself, having found a solitary spot on the banks of the Iris - a river flowing through the midst of Pontus. It rises actually in Armenia, passes through our parts, and discharges its stream into the Black Sea. By it the young man found a place with a luxuriant growth of trees and a hill nestling under the mass of the overhanging mountain. There he lived far removed from the noises of the city and the distractions that surround the lives both of the soldier and the pleader in the law courts. Having thus freed himself from the din of cares that impedes man's higher life, with his own hands he looked after some old people who were living in poverty and feebleness, considering it appropriate to his mode of life to make such a work his care. So the generous youth would go on fishing expeditions, and since he was expert in every form of sport, he provided food to his grateful clients by this means. And at the same time by such exercises he was taming his own manhood. Besides this, he also gladly obeyed his mother's wishes whenever she issued a command. And so in these two ways he guided his life, subduing his youthful nature by toils and caring assiduously for his mother, and thus keeping the divine commands he was traveling home to God. Then there fell on the mother a grievous and tragic affliction, contrived, I think, by the Adversary, which brought trouble and mourning upon all the family. For he was snatched suddenly away from life. No previous sickness had prepared them for the blow, nor did any of the usual and well known mischances bring death upon the young man. Having started out on one of the expeditions, by which he provided necessaries for the old men under his care, he was brought back home dead, together with Chrysapius who shared his life. His mother was far away, three days distant from the scene of the tragedy. Someone came to her telling the bad news. Perfect though she was in every department of virtue, yet nature dominated her as it does others. For she collapsed, and in a moment lost both breath and speech, since her reason failed her under the disaster, and she was thrown to the ground by the assault of the evil tidings, like some noble athlete hit by an unexpected blow. And now the virtue of the great Macrina was displayed. Facing the disaster in a rational spirit, she both preserved herself from collapse, and becoming the prop of her mother's weakness, raised her up from the abyss of grief, and by her own steadfastness and imperturbability taught her mother's soul to be brave. In consequence, her mother was not overwhelmed by the affliction, nor did she behave in any ignoble and womanish way, so as to cry out at the calamity, or tear her dress, or lament over the trouble, or strike up funeral chants with mournful melodies. 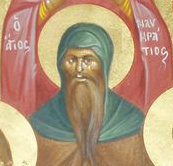 On the contrary she resisted the impulses of nature, and quieted herself both by such reflections as occurred to her spontaneously, and those that were applied by her daughter to cure the ill. For then was the nobility of Macrina's soul most of all conspicuous ; since natural affection was making her suffer as well. For it was a brother, and a favorite brother, who had been snatched away by such a manner of death. Nevertheless, conquering nature, she so sustained her mother by her arguments that she, too, rose superior to her sorrow. Besides which, the moral elevation always maintained by Macrina's life gave her mother the opportunity of rejoicing over the blessings she enjoyed rather than grieving over those that were missing."